The longer I live in Vietnam, the more I realize just how wonderful (in a good/bad sort of way) it is to be in a developing country. For our Environmental Science class, we toured the different canals around HCMC and were able to engage in a first hand learning experience how the garbage system works. At garbage stations around the city (there are around 17 but they need about 6 more to really be efficient) people pick through garbage by hand. Literally, outside of these smelly, unsafe, unsanitary areas. .. people do this to earn a little extra income. Most of them do this with their bare hands and have no masks/sanitary equipment. It’s the norm for HCMC but if that were the case in the states, well, it wouldn’t be. There is a much different sense of necessity here as well as means of what to do in order to merely survive. Seeing people do this is a very grounding experience. I wish everyone had the opportunity to see the lives of these people, maybe it would encourage them to be less wasteful and realize how they should take full advantage of the wonderful system America implements. America has its problems, sure. However, at least we have recycling and garbage treatment plants. We also found out that certain countries, such as the Netherlands and even the U.S., have paid for construction of more garbage stations around HCMC. One of the most interesting things about these donations are that many people refuse the help. The treatment plants are built, of course, but the Netherlands have offered to do more than that. They have offered toilets to those without them. We might think it’s insane to not have a toilet but for those in more slum-like areas, they just dump everything in the water. It’s easier, more convenient. Trash/etc. is thrown out the window. Pretty much every kind of waste goes in the canals. WHY do people not realize how bad this is for their health and the health of the environment? For me, these were the most pressing questions that arose as we drove around the city. Why? First of all, it’s a matter of cost. Vietnam is a developing country and has little money to invest in advanced technology for waste management, recycling programs, etc. Also, in a city of 10 million people, everything is squished together. Therefore, the streets are very thin, more like alley ways. It’s impossible to get any sort of large garbage truck down such small streets. Instead, the alleys are cleaned by manual workers who have small carts and a broom. They go street by street and sweep up garbage. The largest problem, however, is awareness. Many Vietnamese have no idea how their actions affect their health and the environment. When they throw waste into the canals and on the banks, mosquitos and rats flourish. This leads to disease. Living in such unsanitary conditions is, in general, very harmful to their health. My environmental professor even told me people catch and eat fish out of the canals — as they don’t understand how eating the fish from such dirty conditions could be harmful. 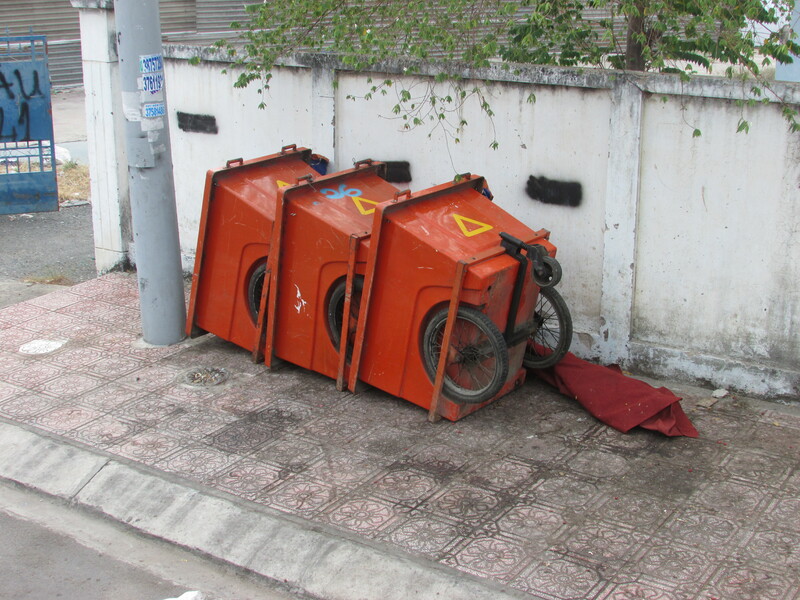 In this way I have been intrigued by the waste management system of HCMC. It’s something I had never really considered before and without doubt, have taken advantage of. 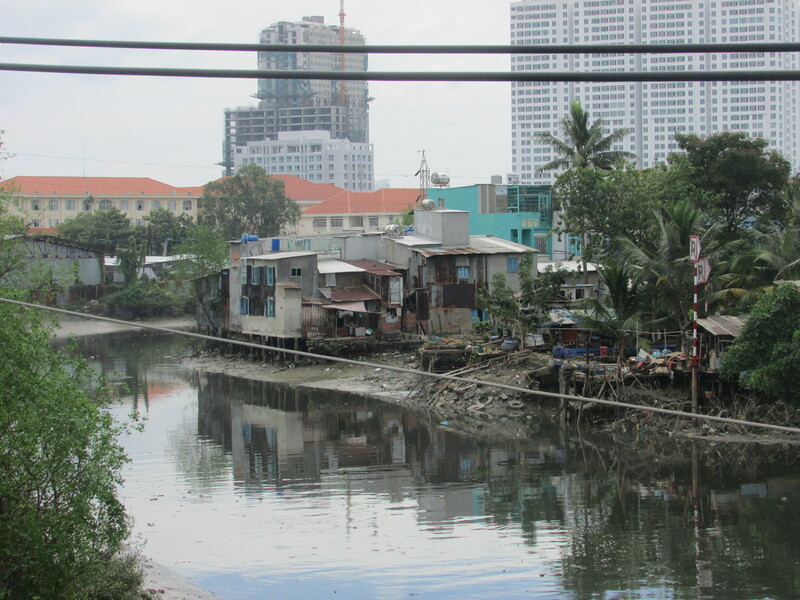 Development is such an important part of HCMC and becomes evident when you see slums and the conditions of living. It’s even stranger to see modern apartment buildings behind the slums. Every day, I become more and more appreciative of this experience — it has been a month now and I think I’m finally starting to really settle in. A friend from CHina made spicy tofu soup, which I didn’t try because I don’t eat tofu, but it looked delicious! Two friends from Italy made homemade vegan tiramisu and salami cioccolato, both of which looked fantastic but I couldn’t eat because of Lent! America was well-represented with one friend who made a ton of bacon, a girl made hotdogs stuffed with cheese and potatoes; I helped my friend make an apple crisp and I made buckeyes! Life here has picked up quite a bit here these last two weeks. I have been interning at the M.A.R.Q. museum two days a week, doing various tasks. I put ancient pottery back together, properly document and store artifacts, assist in constructing the exhibit decorations, and overall understanding the ins-and-outs of the museum. It’s been a lot of fun and easy work, something I can definitely see myself doing in the future! School has also quickened its pace- more homework every day and more advanced Spanish grammar and vocabulary. My Spanish has definitely improved since when I first arrived, and is constantly getting better. I talk to my host family a lot, during meals or when watching movies together, and go out with them a lot as well. I love going to the gym with my host sister Olga. She is so sweet and funny, and tries practicing her English with me. Last weekend, we went shopping together and designed our outfits for Carnival, which is one of Spain’s biggest festivals. It’s a weeklong celebration, filled with beautiful and fun costumes, lights and decorations, and fun activities and concerts. People prepare for this celebration weeks in advanced. My host sisters already had their outfits planned out back in January. Olga and her friends were to be butterflies, and Idoia and her friends were all going to be Pippy Longstocking. Basically, it was Spain’s massive Halloween celebration, and the buildup to the weekend got me pumped. I decided to go as a Can-Can girl since my host family already had the costume. The big Carnival celebration took place on that Saturday, and it was the biggest group of people I had ever seen outside in which everyone, and I mean EVERYONE was dressed up. Every costume you could imagine was there, from giant Leggo Men, to Smurfs, pirates, movie stars, animals, and more… you name it, and it was there. Most of the people in the streets were young adults, and there were thousands of them, all drinking, listening to music, and enjoying each other’s company and costumes. I went with my host sisters first, to see how the Spaniards celebrated, and eventually met up with my American friends later. We went to the concerts, which mainly played American oldies from the 80s, and of course, to the food stands. It was an absolute blast, and I stayed out until 8 am the next morning! I couldn’t believe I didn’t collapse from exhaustion, but there were so many people and excitement that I couldn’t leave until the city decided to sleep. On Sunday, I slept well into the day, and spent the end of it relaxing on the beach with friends, reminiscing about how crazy the night before was. I got to work with ancient bones in the museum this week, which was incredibly cool. I also met some South Saharan immigrants living in Alicante, who live here to avoid the political turmoil in Africa, as well as learn Spanish and English. It was really interesting hearing their stories, and having them feed me and some other students their typical food from their country. This weekend was a little more relaxed, as compared to Carnival. 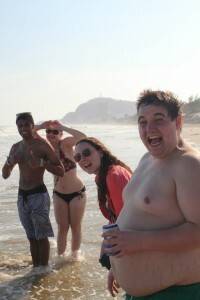 My friends and I spent a lot of time at the beach, playing volleyball and socializing. On Saturday, we went to a small city near Alicante, called Murcia. When I originally told my host family I was going there for a day trip, they cringed at first and asked why. I told them because I wanted to see it and it was close enough for a day trip. Ten of my friends and I went that Saturday morning around 11 am, arrived at noon, and started exploring right away. I realized right away why my family all cringed- there wasn’t much in Murcia. There was a cool Cathedral and old Moroccan themed casino, but not much else than that hahaha. We all had lunch near the river that runs through Murcia, and later we all got ice cream and hung out around the city. We stayed until about 6 pm, walking around and exploring, and returned around 8 pm. Surprisingly, for not having done too much, we were all tired and spent the rest of that night at home with our families.The next day I watched Avatar with my host sister and her boyfriend, Tony, all in Spanish. It was easy enough to understand everything, and I learned a few new words as well. On Monday, after school and my internship, I met my intercambio Alberto. He is a Spaniard I am assigned with to converse in English and Spanish, allowing us both to improve in our speaking abilities. He is 24 years old, and is studying law and finances at the university in Elche. We went to a little coffee shop with cupcakes, and talked for about two hours. He is a very sweet guy, and interesting too. 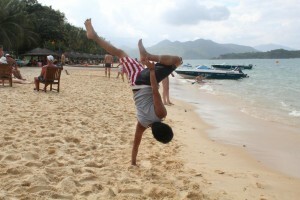 He loves surfing and playing water sports, and wants to learn English so he can eventually move to the states. It was fun talking with him, and I plan to meet with him next week to talk more. 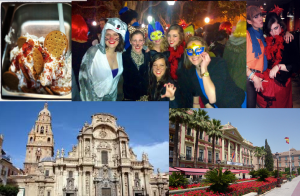 I am really excited for this weekend- the USAC program put together a trip to Granada for all the students. My host family says it’s one of their favorite cities, and one of my good friends is studying abroad there, so I am excited to see what it has to offer! Updates to come! Friday was one of the best days ever. My friends and I went on a (free!) tour of the Freia chocolate factory with the International Student Union from Uni. On the train ride there, we were all joking about how we hoped it would be like WIlly Wonka and have a river of chocolate and edible walls etc. Obviously, we were joking around, but seriously this place was magical. As we approached the building, the smell of chocolate was impossible to miss and it put a smile on all of our faces. First stop inside the factory? The super awesome candy store, where everything was at least 50% less than in stores. We all came out with bags full to the brim. One girl bought an entire display of Oreos! Next stop was the chocolate making room. By far, the coolest thing. We sat around picnic benches as our tour guide, Inge-Johanne, placed bowls full of different Freia chocolates in front of us. There were at least 6 different candy bowls on each table. Then came the fun part: we each got to make our own Freia chocolate bar! 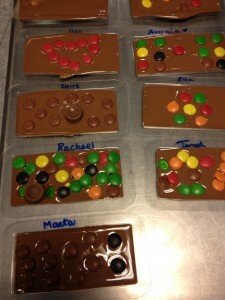 after spreading the melted milk chocolate into our mold, we used the different candies to “decorate” our precious creations. It was so neat to make chocolate! After this, we headed to Freia Land, Norway’s take on the concept of Willy Wonka’s chocolate factory. Seriously, coolest thing ever. We gathered into the room that looked like a giant Kvik Lunsj (Norway’s favorite candy car; basically a KitKat) and Inge pulled out a silver platter stacked with mini Kvik Lunsj bars. Then, a secret door opened up and we were in the middle of the rainforest, on the hunt for cocoa pods. We walked into a cave and found ourselves in an ancient meso-American temple, complete with wall paintings and a giant stone alter in the middle. We learned the story of how chocolate was discovered and revered and eventually used as a form of currency. A second secret door opened, and we stepped into a time machine! Inge asked for a volunteer to crank back the clock, so I (of course) quickly volunteered and took us to 1527. From there, we visited a 16th century ship bound for the Americas, a dutch windmill that created hot chocolate powder, Norway’s first chocolate shop/parlor, and finally crossed giant glaciers and traversed the Norwegian mountainside to get back to the factory, receiving a different Freia chocolate at each stop. 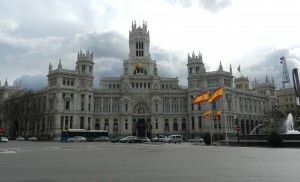 I am starting to feel very comfortable here in Madrid. I have developed a routine, I feel safe when on my own in the city, I have met some amazing people, I started volunteering, and I have had whole conversations with Spaniards 🙂 Life is good right now. I started volunteering at a bilingual elementary school! The moms of the kids and the teachers (the PTA) decided that they wanted english speakers to play with the kids in the after school programs so the children’s exposure to english does not stop after school. I go every Thursday from 4-6 and help with a “circus” after school program, it is basically a theatre class for 3 & 4 year olds!! It is my most enjoyable experience thus far. The kids love me 🙂 The circus program is from 4-5 and I help a Karate program from 5-6. The instructor speaks zero english and I think my only job is to attempt to practice Karate with the kids….I think. That is what I have been doing for the last 2 weeks. The instructor just laughs and gives me a thumbs up, a sure sign of a good job right? I like the Karate class, the kids are older and they speak more english then the babies which is nice. Volunteering might be the best decision I have made. Now, they say when you study abroad there is a period of time when you slump in to a depression, you miss home and wonder why you are in a foreign country with strangers. I can tell a lot of students in the program are reaching this stage, I however, am DETERMINED to fight it. I will admit when/if I reach that point, but I do not want to spend my time wishing I was anywhere else. I do miss home and school but I am really enjoying myself here. My friends that I met here and I are planning a trip to Rome!! I am super excited! We are going in late March during spring break!! We booked the flights and the hostel (yes hostel) over the weekend! Hopefully I do not get sick this time, but I bought the flight insurance just in case! Next week the study abroad program is taking us (well we paid for it) to Andalusia, a region in the south of Spain. We are going to Granda, Coroba, and Seville for the week! It should be a lot of fun! One of my friends from high school is studying in Seville and we are planning on meeting up. I am having a blast here and I know how blessed I am to have this experience. Futbol is more than a sport. Spaniards rarely eat with their hands, I mean RARELY. They only eat with their hands when they eat burgers and sandwiches! Everything is eaten with a fork and knife, from croissants to french fries, to pizza. Their diet seems to consist of mostly pork, bread, pork, potatoes, and pork. My spanish professor says instead of apples, students give teachers pork. 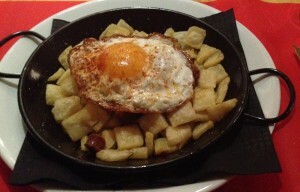 Patatas con Huevos y Chorizo! YUM! Banco de España! One of the most beautiful buildings in the city. 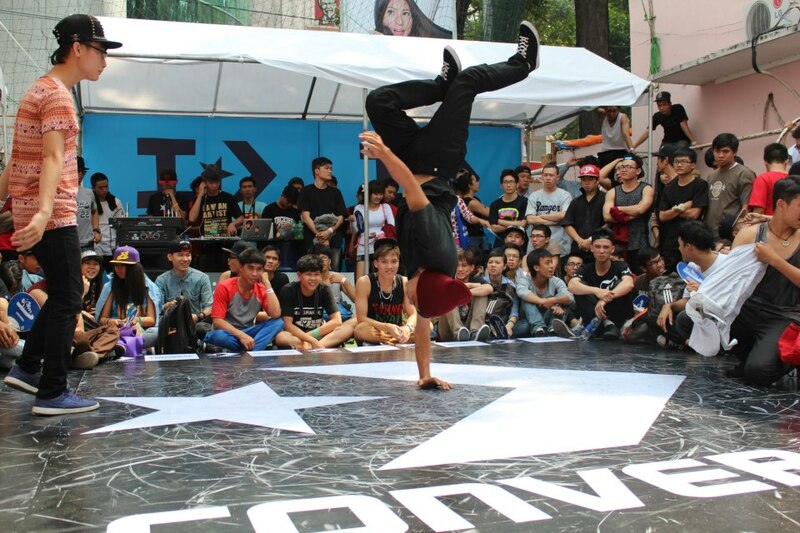 Converse shoes, beanie caps, graffiti, and break-dancing are all elements of today’s hip-hop scene in Vietnam. While these facets aesthetically resemble a similar culture in the United States and other parts of the world, Vietnamese hip-hop conveys a deeper message hidden under the clout of imported flash. 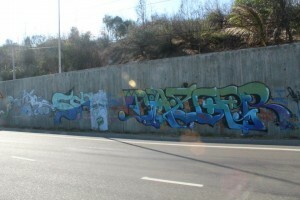 MCs, graffiti artists, b-boys, and DJs comprise only one of the counter-cultures that have developed in Vietnam through the processes of globalization. As one of the most youthful countries in the world, Vietnam must balance the traditional customs of past generations with the trends and developments of today’s world. I have chosen this picture to expand upon for a number of reasons. Having been involved in the hip-hop scene in the U.S., I hope that I can relate to similar minded youth in Vietnam. I believe that Vietnamese hip-hop is a developing culture that is different than similar subcultures in other countries. Finally, I view the hip-hop subculture in Vietnam as lens through which one can visualize Vietnam’s progress and development. In the early 1970’s hip-hop formed in the Bronx in New York City as a form of self-expression and protest by the youth. As it spread, the messages associated with the movement also found audiences in Europe, Asia, and other parts of the world. By the end of the 20th century, and with the economic success of the early 21st century, Vietnamese youth readily gained access to the rest of the world through venues such as MTV, the internet, and their neighbors in Asia. It wasn’t long after that a hip-hop culture developed in Vietnam. However, in my observation and interaction with hip-hop artists in Vietnam, there is an almost entirely different message being portrayed underneath all the baggy shirts, flat brim caps, and break-beats. While American hip-hop music is notorious for off color language and a subculture that often lends itself an unsavory reputation, Vietnamese describe their brand of hip-hop as “clean.” Raps are often about romance, youth culture, dancing, expressing yourself, and being who you want to be. There are almost never political or societal issues conveyed through Vietnamese hip-hop. The overall message is resoundingly individual and being true to yourself. As said in Saigon Electric / Yo!, a 2011 film exploring Vietnam’s street dancing scene, “We [Vietnamese] dance because we have to. It’s all we have to live for.” I believe that this quote highlights the ambiguity of the task Vietnamese youth have in forging their own culture. When President Clinton visited Vietnam for the first time in 20 years following the end of the conflict in Vietnam, he was exposed to a new generation of Vietnamese who had the freedom to find futures beyond the wars of their parents and grandparents’ generations. However, as Vietnam steadily opened up to the rest of the world, the next generation of youth have pushed the envelope even further in the creation of a unique, and thriving youth culture. Converse’ arrival and success in Vietnam display just how eager Vietnamese youth are to ‘catch up’ with their contemporaries around the world. While Converse’s image might inspire images of old-school basketball or pop-punk bands and skater culture in the United State, Converse has harnessed a slightly different approach in Vietnam. The Converse Street Festival in Ho Chi Minh City represents nearly a decade of growing presence in Vietnam. While staple “Converse cultures” such as skate boarders, rock bands, and b-boys transitioned and took root in Vietnam, Converse successfully marketed itself to a population that literally grew up with the brand in Vietnam. While it seems that Vietnamese artists in the hip-hop scene earnestly take their inspiration from the United States, Europe, South Korea, Japan, and other hip-hop centers, a unique Vietnamese identity is slowly taking shape. When I arrived on site at the Converse Street Festival, there was already a large crowd gathered on the main stage where the b-boy crews were battling. I noted that with few exceptions, nearly everyone in the crowd was my age or younger, and that their energy far exceeded what should have been possible for the amount of people. I have been to jams (b-boy competitions) many times larger in Chicago and the United State, but the excitement and talent of the performers, spectators, and judges in Vietnam was just as comparable! Hip-hop in Vietnam, through conveyed through the same vehicles as ‘original hip-hop’ across the world, conveys a deeper story. The growth of this subculture parallels the development of Vietnam in recent years, not only economically or culturally, but also consciously. I believe that it would not be too farfetched of a statement to say that Vietnamese hip-hop is proof of Vietnamese identity taking new shape in an uncertain future. With over half of its population under the age of 30, Vietnam’s youth are eager to soak up the rest of the world’s trends. However, they do not seek to just catch up, but also gain the tools to forge their own of unique identity whether it be through industry, policy, or something as obscure as street dancing. For more info on the Vietnamese Hip-Hop scene, specifically b-boying check out these links! 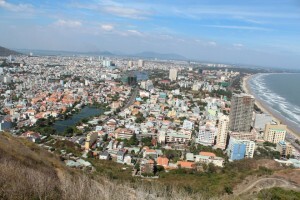 Vung Tau is a popular destination for short getaways. An hour and a half away from HCMC, the city used to be known as a petroleum capital of Vietnam, but also boasts a strong fishing industry and its beach resorts are a draw for tourists. This was our first spontaneous trip out of the city that we Loyola students took of our own volition. While our roommates helped us book places and figure out what to do, we were going to be on our own there. We traveled via hydrofoil to get to Vung Tau and were bombarded with sales pitches, persistent taxi drivers, xe oms, and rickshaw peddlers the moment we stepped off the dock. Most likely because of the impending Tet holiday, much of the resort city was already empty as people returned to their hometowns. This made us as fresh a group of tourist bait as possible. Between figuring out where our hotel was, gathering our return bus tickets, and finding out that the hotel reservation was actually for a “Tinson D.,” it was quite an experience. However, the rest of the day and weekend were phenomenal. We explored the whole of the peninsula, and even ended up at the exact same beach that I visited with my family 5 years ago! 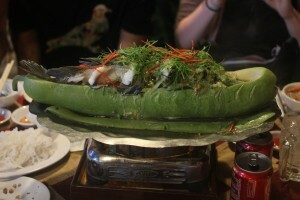 Friday evening, we sat down for dinner at Ganh Hao, which nearly every local we met suggested to. Sitting nearly 5 meters away from the sea and literally have our pick of the day’s best catch available, it is nearly impossible to describe the ambiance as anything more than splendid. 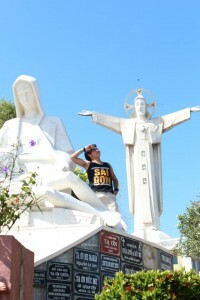 We capped out trip by scaling the local religious/tourist attraction known as Christ the Redeemer of Vung Tau. Finished in 1993, this larger-than-life statue of Jesus stands over 32m as one of the tallest of its kind in the world, larger than even the famousCristo Redento in Rio de Janeiro! Getting to the statue is a pilgrimage in and of itself as it is located at the summit of a 270m hill. Scaling the the hill, there are rest areas every 20-30m that showcase sculptures of prominent figure in Christianity such as Moses, the 12 Apostles, Angels, and etc. As a Catholic, it was really inspiring for me to see how my faith is practiced in my parents’ homeland. When we finally reached the Jesus statue, we also found out that inside of the statue is actually a small chapel and a 133-step winding staircase that took you up to the shoulders of Christ! Unfortunately, shoulders and knees were required to be covered before we could step in, so many of us shorts-wearing Loyolans had to improvise.. By tying some of my extra bandanas to over my knees and throwing on an extra shirt over my tank top, the elderly gentlemen watching over the door nodded their approval, and I began my ascent to one of the most breathtaking views ever. Nearly 300m above the ground, on top of Christ’s shoulder, I saw city, land, air, and sea all at once. I did my best to take photos and video, but nothing could do that view justice than being there yourself. A couple hours later, we caught out ride home at the hotel. As my friend Brian goes to detail to say, the ride home was very much like a ride on Harry Potter’s ‘Night Bus!’ Being the only Vietnamese speaker during the Vung Tau trip was an enlightening experience I’ll never forget. I have to personally commend tour guides and other bilingual professions on their efficiency in facilitating and helping large groups have as much fun as they do when abroad. However, I can’t say that I’ll miss being our psuedo-tour guide as it could be frustrating and difficult at times to navigate unfamiliar territory with such a large group. It was a fun and successful weekend though! With the Tet holiday coming up, I’ll be venturing out on my own with my roommate to his hometown of Phan Thiet for another adventure and vacation. If you haven’t had the chance already, you should really check out fellow Loyola blogger and friend Brian Priddis’ recap of our previous weekend in Vung Tau! There are 24 hours in a day. Those 24 hours can be divided into three sets of eight hours. The Spanish day essentially follows the structure of 8 + 8 + 8. Eight hours of rest, eight hours of work, and eight hours of free time. We’re thinking that we are not going to possibly have enough time to get all our schoolwork done and explore the city and absorb the culture and travel, but eight hours a day for free time is a lot. And that’s just the five-day work week. It’s interesting that Spaniards think of the day this way, with free time and time to enjoy oneself built into the routine. In the U.S. it seems like we know that we need to be at work or school for eight hours a day, but then we have to come home and do more work and more things and if we don’t totally get eight hours of sleep then that’s the way it goes. We enjoy life so much less than we should. Here, things are more relaxed. Whenever we leave to go on a walk or to go out for food, our host señora says “se disfrute mucho”, which means “enjoy yourself to a great extent”. Here, the meals are slower. They are meant to be cooked with love and shared with friends over good conversation. Life is lived in the street so that it can be shared, so that experiences can be had and friendships can be made. Life here is about enjoyment and living in the moment. If nothing else, this is what I want to bring home with me. To remember to let myself enjoy life, and to remember to divide my time so that I can equally feed my body and my soul, as well as my obligations to society. Sea breezes, sand castles, calamari, in february? The week of New Years is about to start and Ho Chi Minh City is already starting to clear out. Everywhere, decorations are being put up and flags are being flown proud. So far, I get the feeling of 4th of July and thanksgiving is coming. National pride is everywhere, flags and banners are everywhere. Today I saw someone driving around in a Mercedes with a giant 6×9 flag attached to the roof. People are getting filing out of the city and traveling to stay with family during the celebration. The city is quieter and it is ten times easier to cross the street, even during rush hours. The excitement can be felt in the air everywhere around the city as people clean their shops and restaurants and post signs saying they will be closed during the New Years. I can’t wait for the fireworks. 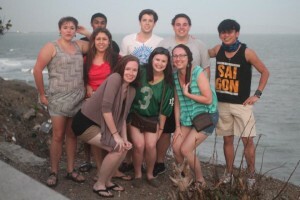 Last weekend, a group of nine of us Loyola students took a trip to Vung Tau, which is on the coast just east of Ho Chi Minh City. We woke up early on Thursday morning to make it to the river to catch a hydrofoil boat. It was around $10 for the hour and a half ride through ports and forests, all while weaving in and out of huge container ships. This was really cool because we were going so fast and it was pretty smooth. When we got off the boat though, we were overcome with the sea breeze and sunshine. It is crazy how just an hour boat ride and the air clears right up and it is noticeably easier to breathe. We walked over to the bus station and bought our tickets, then checked into our hotel and straight to the beach we went! The waves were huge! It was so much fun to jump and play in them, even though it was really really really salty. After what seemed like 45 minutes, but was really 3+ hours of swimming and building sand castles, we all realized we were starving. We caught some xe oms to a restaurant that everyone was referring us to. Our table was literally 15 feet from the waves and we had some of the freshest seafood I have ever had. It was so yummy, especially the calamari. That night, we played a card game in the hotel driveway on little plastic chairs, it was awesome, especially when the desk worker guy played with us. A couple people went to go get food and when I went to go find them, I ran into this guy who called himself “Crazy Moe.” I tried calling him just Moe a couple times, but he would correct me every time. He walked me to his house and I had a good forty-five minute discussion with him. He was 66 years old, fought for the South Vietnamese Navy during the Vietnam war, was “reeducated” after the war, and about his family. His first daughter was born in 1972, his youngest, 1992. It was great to hear someone talk about how the government really works in a citizen’s point of view. After checking out of the hotel the next day, we traveled to the base of a giant hill that had a huge jesus on top. Kind of like in Brazil. It felt like the stairs went on forever, but we finally made it to breathtaking views and a strong breeze to cool off with. The journey back was an experience unlike any other… a sprinter van pulled up to our hotel, we climbed in and the sliding around started. Our driver was one of the most aggressive drivers I have ever even seen. It reminded me of the Night Bus in Harry Potter, weaving in and out of thousands of motorbikes. We would just stop in the middle of a huge intersection, someone would climb right from the back of a motorbike into the van, then we would speed away. Another weird thing that happened was it was picking up more and more people as we went. It got to the point where someone hopped in and the driver handed them a little plastic stool to sit on. Something really funny that I’ve been noticing here, restaurants must just pick “popular english music” playlists. I am currently sitting in a cafe, with Jingle Bells blasting. It really makes you smile, especially when you don’t know what you’re eating. This weekend was weird, for the first time in my life, did not watch the greatest game of the year. I could not watch the Super Bowl. I tried to pull a How I Met Your Mother and watch it later without hearing any news of it, but I accidentally saw the score.. but nothing more! It is currently downloading on this super slow internet… at between 12 and 24 KB/s… not to mention the only one online that I could find was 8.9GB. I am anxiously waiting to watch it when it finishes downloading. It’s been downloading for over 15 hours, and just over half way.. I hope I can last! Back to classes for a couple days, then now I am off until the 17th for the New Years. After growing up in Wisconsin, this whole hot weather in February stuff…. I feel like I might actually melt into the sidewalk. Check out my photos here!